There is a printable version of these rules in the PDF file attached this page (link at the bottom). This campaign is fought as a series of run-wutcha-brung dogfights using Check Your 6! Jet Age. These rules are designed to generate scenarios based on a randomized selection of available planes, so that a dogfight can be played no matter who shows up for the game. Each player is given an incentive to use his own planes by having personal named pilots who gain experience as the campaign progresses. Campaign Players. The core players of the campaign are called campaign players. Campaign players are expected to own the rules and bring the 1/300 scale model planes, hex mats, stands, plane rosters, dice, pencils, etc. needed to play. Guest Players. Other players are called guest players. Anyone who shows up just to play a fun dogfight game once in a while but has no interest in owning, collecting or painting planes is a guest player. Each player has up to four named pilots active in the Pilot Roster. As long as a named pilot stays alive, he participates in every dogfight his squadron attends, gaining experience and skill levels. A named pilot can never change what type of plane he flies, but each named pilot can be assigned to a different type of fighter so that a player can rotate what planes he plays in each game. Named pilots can't fly bombers, but may be assigned to fighters normally used for ground attack (propeller fighters, Thunderjets, Shooting Stars, Meteors, Panthers, etc.). A player may have named pilots on both sides of the conflict. Extra planes not containing named pilots are filled by guest pilots (who have no pilot roster entry). Pilots are ranked by experience, and the highest ranked pilot in each flight must be in command of it. A Green pilot has completed less than 6 missions. A Skilled pilot has completed 6 or more missions. A Veteran pilot has completed 12 or more missions. An Expert pilot has completed 24 or more missions. Each kill counts as 1 extra mission of experience. New named pilots start as Skilled with 6 missions completed (and 0 kills). A named pilot can become an ace on paper by shooting down 5 or more enemy aircraft during the campaign, but only gains the CY6 Ace skill level by becoming an Expert with 24 or more missions of experience. This is to keep pilots from advancing too quickly, and prevent leapfrogging experience levels. To determine guest pilot experience, roll 2d4 for Chinese and Koreans, 2d6 for UN and Soviet pilots. If the experience roll for a UN or Soviet guest pilot (or bomber crew) shows doubles, roll an extra d6 and add all 3 together. If the total is 15 or higher, the guest is an Ace. There can only be one Ace guest pilot per side - once the first Ace is generated, stop using a third die to find Aces. Anytime a named pilot is shot down, determine whether he survives and returns to base using the Crew Survival rules from the rule book. If he fails to return from a mission, change his status from Active to KIA, MIA, POW, etc. as appropriate, and replace him with a new named pilot before the next mission. Personal Flight: Each campaign player brings a personal flight of four fighters in similar squadron markings to each battle. Flights of MiGs may have up to six planes (MiGs typically operated in 3-pair groups). At least one plane in the personal flight must be piloted by one of the player’s named pilots. Personal flight planes that are shot down are assumed to be replaced with more planes of the same type (manned by replacement or recovered pilots), so there will always be 4 (or 6) available for the next mission. Auxiliary Flights: All flights in play that are not personal flights are called auxiliary flights. Flights of fighters or fighter-bombers (such as Shooting Stars, Panthers, Thunderjets, Meteors, Corsairs, Mustangs, Yaks, etc.) should be given to guest players. Bomber Flights. Flights of slow, clumsy, heavily loaded bombers (B-29s, B-25s, A-26s, Tu-2s, IL-10s, Skyraiders, etc.) should be run as non-player entities by one or more players. Do not plot moves for these planes - after all movement plotting is done, just move them as desired. Each dogfight has a mission profile which defines the goals of the players and the set up. If somebody has bombers or fighter-bombers they want on the table, the mission is a bombing mission. If there are only fighters, the mission is a fighter sweep. The host gets the final say in the type of the mission. Planes. Add 3-12 bombers in 3-ship flights or ground attack planes in 2-, 3- or 4-ship flights. Assign a player to run the bombers. Each campaign player brings his own fighters; guest players run auxiliary planes given to them. Each player may have a single flight of 2-4 fighters with one flight leader, or 2-6 MiGs organized in leader/wingman pairs. Escorting players declare the number of planes first. Altitude. The bombing player picks two adjacent CABs as the altitude. There is no middle CAB boundary. If the bombers are B-29s, the CABs are High and High-Top, otherwise any 2 neighboring CABs from Medium-Top on down can be chosen. Table Edges. The long edge spanning sectors A-C-E is friendly to the side with the bombers; all other edges are unfriendly. Bomb Load. The bomber player decides whether the bombers are armed at half-load or full load. Bombers Set Up First. Bombers set up at TAL6 in sector C. Each flight must be in a vee formation, its planes in adjacent hexes or 1 hex apart. The bombing C-in-C must be lead plane of the lead flight (at least 1 hex farther forward than all other flights). 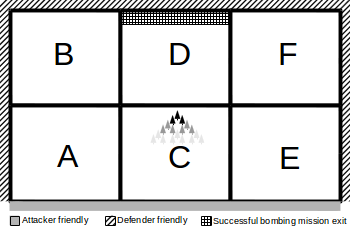 After setup, roll for straggling: if 2d6 plus the bomber C-in-C crew skill bonus is less than the number of bombers, the rearmost flight is straggling by 1d6 hexes, and if the roll is also doubles, the second rearmost flight is also straggling. A flight that straggles off table enters on turn 1. Escorts Set Up Second. Escorts set up second, at any TAL and maximum distance 10 (TALs + hexes) from a bomber flight. Each player's fighters must be in formation together. Success on doubles: may move after all enemy on the first turn. Failure: Move 2d6 hexes farther from all enemy planes. If this puts any planes of a flight off the table, that flight enters the table at that point on turn 1. Failure on doubles: Roll 2d3 to determine maximum starting TAL. The bombers are at light load, and roll before the game starts for ordnance delivery VP. All edges of B, D and F become friendly to the bombers and escorts. All edges of A, C and E become unfriendly to the bombers and escorts. Unreliable Jets. After all planes are set up, each player commanding jet fighters rolls for mechanical difficulties. If the die score on 2d6 is less than the number of planes in his flight, remove one of his jet fighters from the mission. Victory Points. Subtract 1 VP for each fighter brought to the fight (even jets that aborted with mechanical difficulties). Each side gains VP for damaged/destroyed enemies as per section A6.1 BASIC VICTORY POINTS. Planes. Each campaign player brings his personal flight; guest players run whatever auxiliary planes are given to them. Each player may have a single flight of 2-4 fighters with a flight leader, or 2-6 MiGs organized in leader/wingman pairs. The side with more players declares the number of planes first. If the number of planes is tied, the jumped side declares first. Initiative. Each player rolls 1d6, then all dice for each side are added up. The side with the highest total score “got the jump”, the other side is “jumped”. The Communist side wins ties. Altitude. The jumped side picks two adjacent CABs as the altitude. There is no middle CAB boundary. Both CABs must be within the service ceiling of all planes in play. Friendly Edges. The jumped side counts the A-C-E long edge as friendly, the other side counts the B-D-F long edge as friendly. The short edges and bottom are friendly to the side that got the jump if it has fewer planes, otherwise to the jumped side. Failed, jumped: Set up in sector C, flying toward the far edge of D, TAL 6. Failed, got the jump: Set up anywhere in sectors B, D, or F, any TAL, min. distance 8 (hexes + TALs) from enemy planes. Passed, jumped: Set up anywhere, any TAL, min. distance 8 (hexes + TALs) from enemy planes, flying toward long edge spanning sectors B-D-F. Passed, got the jump: Set up anywhere at any TAL, or declare entry hexes on any CAB edge (including top or bottom of CAB) and enter on turn 1, min. distance 8 (hexes + TALs) from enemy planes.